Diagnosing tomato diseases can be difficult. Symptoms can be very similar in some cases and a frequent diagnosis by many of us is simply “soil splash”. Well, soil splash can often encourage and spread disease, but is not itself a disease or disorder. These are some very common problems that occur with tomato plants. This frustrating problem is quite common. Your tomatoes look perfectly beautiful as they grow and ripen, but soon the bottom begins to look flat, then wrinkled and leathery, and finally discolored or black. Generally this occurs if a lack of water or drought stresses the plant just after the fruit forms. A small spot will not harm the fruit, just cut it off after harvest. But if the rot splits open the tomato further rot may occur, ruining the tomato. A lack of water or irregular watering can prevent calcium from traveling all the way through the roots, vine, and finally to the bottom of the fruit. Adding calcium to the soil will not usually help, as the calcium requires water to carry it. To help prevent blossom end rot as well as growth cracks, water thoroughly and deeply each week. Remember that a tomato plant’s roots can be a foot deep and wide. Blossom end rot can also be caused by sudden temperature changes when the plant is setting fruit. Sometimes the rot is minimal, causing only a dark scar on the bottom. Cut the bottom of the tomato off, and it the rot has not penetrated the tomato it is perfectly safe and delicious to eat. Many environmental factors can cause blossom drop. Flowers may develop normally but they produce no fruit. There is no known prevention unless you are able to grow in a controlled environment. The most common cause of blossom drop in temperature, both high and low. If temperature extremes occur in the fruit development state the flowers may drop. Other factors may be stress from drought, over fertilizing or not enough sun when heavy overcast persists. When the weather improves, flowers often continue to develop and crops may be affected only minimally. Cat facing can be the result of adverse or sudden changes in growing conditions. Insufficient water, early transplanting, spiking air temps, all may cause bulges and creases in tomato fruits making it appear similar to a fat cheeked cat. The fruit is perfectly fine to eat, some scarring may need to be cut away. Curling of the leaves is not necessarily a problem, certain varieties may commonly experience leaf roll or curling. Do however check for spider mites or viral diseases if more than one variety is displaying curled leaves. Fusariam and Verticillium wilt are very common to tomatoes and can devastate your plants. The primary difference between the two are weather conditions. Fusarium symptoms appear in warm weather, Verticillium prefes cool weather. The leaves may yellow and wilt, then the stem develops brown streaks moving up the main stem into the branches. When selecting tomato varieties look for an “F” or “V” associated with the name, indicating that it is more resistant to these wilts. The disease will sometimes affect only a part of the plant, and if quickly removed may save the plant. Generally it is best to immediately remove the entire plant to reduce the possibility of it spreading. Crop rotation is also important to reduce infection and removal and disposal of all plant debris and roots. This disease of the foliage appears early in the season. Spots develop generally on the mature tomato leaves and can spread rapidly in warm wet weather. Often the spot starts out brown and develops a yellow ring, beginning with the lower leaves and working it’s way up the stem. The spots expand across the leaves including the veining. The blight can cause fruit to drop. Removing infected leaves promptly will help control the disease without chemicals. Avoid overhead watering to help keep foliage dry. Applying mancozeb or copper fungicide may help prevent and control spreading of the blight if the situation gets severe. Rotate your crops and plant blight resistant varieties. Late blight will often appear near harvest time. 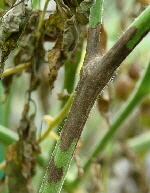 Stems and leaves may develop lesions and water soaked patches. Foliage may turn pale, then brown and eventually papery. Fruit may develop brown patches and black lesion may appear on the stems. Cool wet weather encourages late blight. Fungicide sprays may be used as prevention mid season. Spores are dispersed by wind so an outbreak can spread extremely rapidly and cause total crop loss. To prevent Late Blight, spray with a fungicide that contains Streptomyces lydicus. Spray with copper fungicide if the blight is already present. Leaf Spot is a late season infection of the foliage but does not directly affect the fruit. Septoria leafspot produces small spots on the leaves, typically beginning on the lower leaves at about the time the fruit is setting. As the disease progresses the leaves turn yellow, then brown and eventually fall off the plant. The plant can become weak if defoliation is severe and the exposed fruit may sunscald. Cool wet weather aids in the spread. Remove infected leaves promptly to help control the disease without chemicals. Rotate crops, do not overhead water, and select resistant varieties. Damp rainy weather will commonly encourage bacteria and fungus. Bacterial Speck and canker frequently develop in prolonged wet periods. Bacterial Speck creates small black specks that do not expand but do multiply. The specks may be found on fruit, foliage and stems. Avoid overhead watering to reduce moisture on the foliage and fruit. Use soaker hoses to water directly to the soil. Several tomato viruses may cause discoloration of the foliage or fruit. The fruit may look dappled or colored in mosaic like patterns. Infected plants should be immediately removed to prevent spread of this common virus. Look for Mosaic resistant varieties. All kinds of critters will leave all manner of damage to your tomatoes. Birds may stab at them with their beaks, deer may take a single bite out of several tomatoes (for some reason they don’t just eat one whole tomato! ), rabbits and chipmunks will nibble at the undersides, and of course insects and slugs will eat or burrow into your tomatoes. Although every type of critter damage cannot be prevented, there are some things you can do to help keep the critters away. Tall fencing will keep the deer out. Shorter tightly woven fencing should be set into the soil to keep rabbits and burrowing chipmunks out. And cages and stakes should be used to keep fruit from hanging to the soil where slugs and insects have easy access. Early warning signs of caterpillar presence is holes in the leaves and fruits. The tomato hornworm, or tobacco hornworm, are the most common caterpillar to damage tomato plants. They can be so voracious they can decimate a plant quite quickly, eating the leaves and the fruit. Caterpillars should be quickly removed from your plants by picking them off and destroying them. Hornworms in particular will have larvae developing in the soil. Destroy them by tilling thoroughly immediately after harvest to prevent them from appearing next year to eat your harvest. Cutworms chew clean through the plant stems, generally just below the soil surface, causing the immediate demise of the plant. To prevent cutworm damage install shields at planting time. You can make your own by simply pushing a coffee can or liter bottle open at both ends into the soil around each plant. The collar or shield should be pushed at least one inch into the soil and extend several inches above the soil. These frustrating little buggers chew into your tomatoes. Signs that slugs have been at work are shiny, slimy trails and large irregular holes in fruit and or foliage. Keeping fruit from contacting soil will help as will keeping the plants dry with good air circulation and drip irrigation. Dry hot summer months commonly bring spider mites. These tiny mites can easily be seen on the underside of leaves. Typically working their way up the stem, you will see lower leaves turning brown and dying off. The leaves often look faded or discolored first, then lose their color before turning brown. At the first sign of infestation, neem oil spray every 4 days can help eliminate Spider Mites as well as whiteflies. Spray the plant until dripping in the evening to avoid leaf scorch from the sun. If the infestation got out of control and you failed to notice, you will need to spray with hot pepper wax instead of neem oil. The barrier created by Hot Pepper Wax will repel spider mites, whitefly and aphids. These tiny little critters live in the soil and destroy tomato plant roots. There are of course chemicals you can use to control them, but why not try planting Marigold Golden Guardian? Grow them through the season, then shred and till them into the soil, roots and all. In theory the marigold is nematicidal, but I have not tested this specific marigold against nematodes myself.